Essentially a version of the Y7 2019 that pays a lot more attention to selfies, the Huawei Y7 Prime 2019 delivers most of its base model's technical pros and cons. These include the middling combination of an eight-core 1.8GHz Snapdragon 450 processor , which won't be plugging it into Phonerated's list of the best octa-core models any time soon, and a modest 3GB RAM . Note that a few closely-comparable mid-enders pack at least 4GB of RAM under the hood. 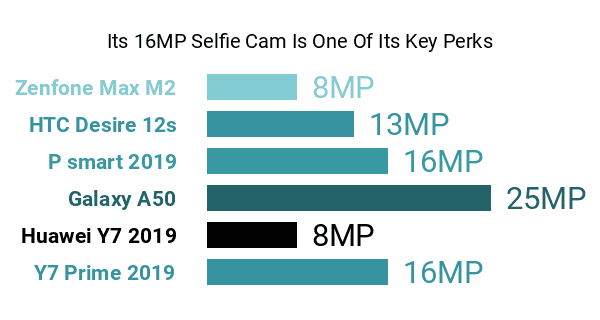 Going back to its selfie cam, this Prime edition boasts a 16-megapixel front-facing camera that outstrips the measly 8-megapixel shooter of its mother model by a huge margin. It also brings to mind our list of the best phones for selfies, at least in terms of raw pixel resolution. 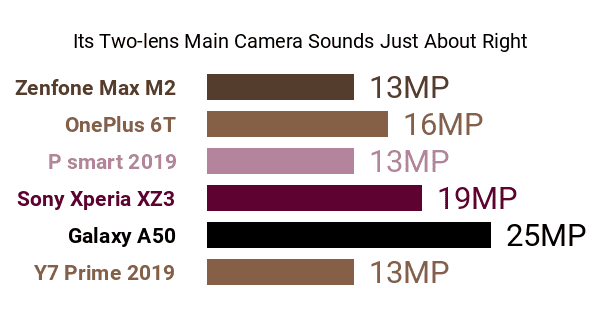 At the back, it brings back the Y7 2019's 13- plus 2-megapixel dual camera setup , which is decked out with AI optimizations, such as AI scene recognition. Also sitting on its backplate is a circular fingerprint scanner that works hand-in-hand with its Face Unlock 2.0 technology for phone and data security. 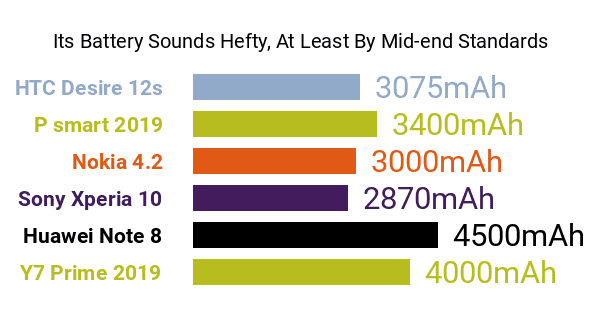 The Y7 Prime 2019's large 6.3-inch 19:9 dewdrop-notch display winds up as a solid pro in our book, although its decision to stick to an HD+ (1520 x 720) resolution is an obvious con, knowing that the best phablets on the market as of this data-driven review did not settle for anything less than FHD/FHD+ (1080p) definitions. Powering the aforementioned specs is an 4000mAh battery , which, compared to what a good number of its middle-class rivals offer, sounds more than appreciable to us -- many models in this class do not go beyond the 3500mAh mark. Its AI power-saving technology is a nice touch as well. With a ceramic-like back texture and the Android 8.1 Oreo + EMUI 8.2 ecosystem rounding out its pros and cons, the Y7 Prime 2019 caters to power-cautious shoppers eying a mid-end phone that offers an above-average selfie camera.